3 2 INTRODUCTION TO THE GETTING STARTED SERIES WordPress is a vibrant Content Management System which allows for the creation of beautiful and completely functional websites. With all the benefits of a secure database, adding complex and often vital functionality to a website is all able to be created and maintained using only WordPress and its many available plugins. 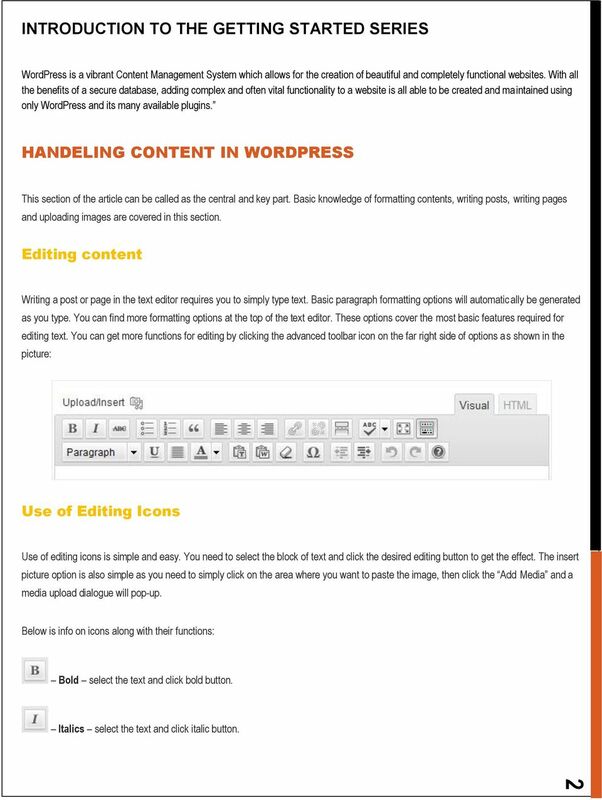 HANDELING CONTENT IN WORDPRESS This section of the article can be called as the central and key part. 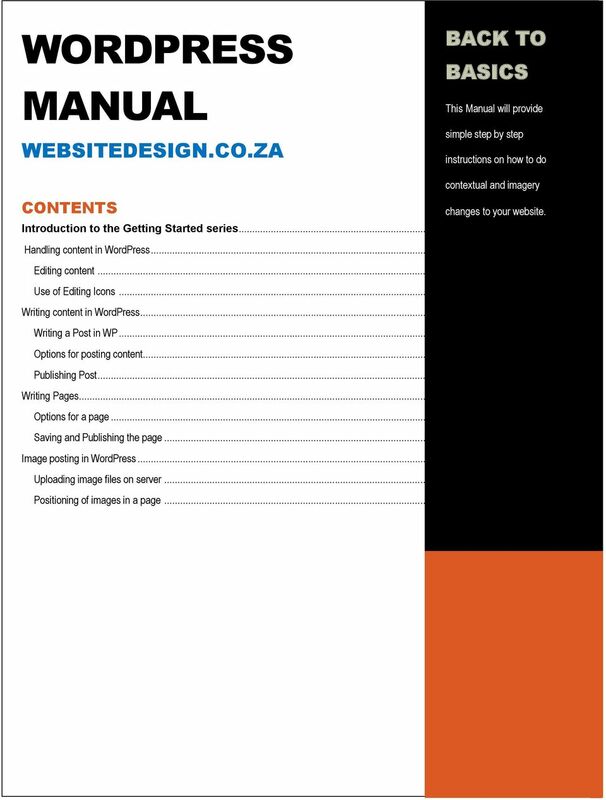 Basic knowledge of formatting contents, writing posts, writing pages and uploading images are covered in this section. Editing content Writing a post or page in the text editor requires you to simply type text. Basic paragraph formatting options will automatically be generated as you type. You can find more formatting options at the top of the text editor. These options cover the most basic features required for editing text. You can get more functions for editing by clicking the advanced toolbar icon on the far right side of options as shown in the picture: Use of Editing Icons Use of editing icons is simple and easy. You need to select the block of text and click the desired editing button to get the effect. The insert picture option is also simple as you need to simply click on the area where you want to paste the image, then click the Add Media and a media upload dialogue will pop-up. Below is info on icons along with their functions: Bold select the text and click bold button. Italics select the text and click italic button. 4 3 Strike Through this is used to add a line through your text: like this. Unordered List this creates bullet points. Ordered Lists this auto numbers your text. Blockquote this is used to create block quotes. Align Left aligns text to the left. Align Center aligns text in the centre. Align Right aligns text to the right. 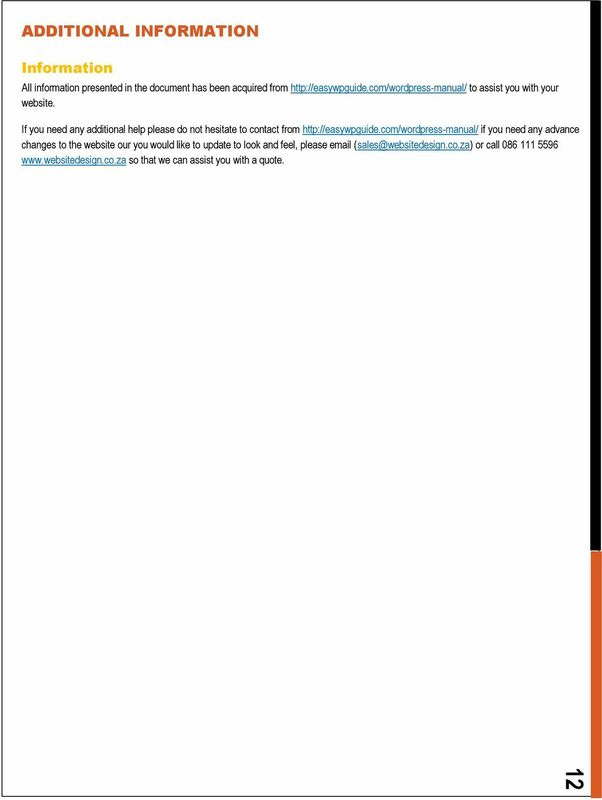 Adds Hyperlink this is the option which can be used to create the links to any website or page. Select the word which you want to create into a hyperlink, and click the add link button to open a dialogue box where you can add a url or select a related page. Remove Hyperlink this button can be used to remove a hyperlink. Split Post it is used to split the post written by you. Spell Check used for checking the spelling of the text in the text box. Advanced Tool Bar this option adds more text editing functions. Underline this underlines the selected text. Font Colour changes the colour of the selected font. Outdent undo an indent. 5 4 Indent this is used to indent the text. 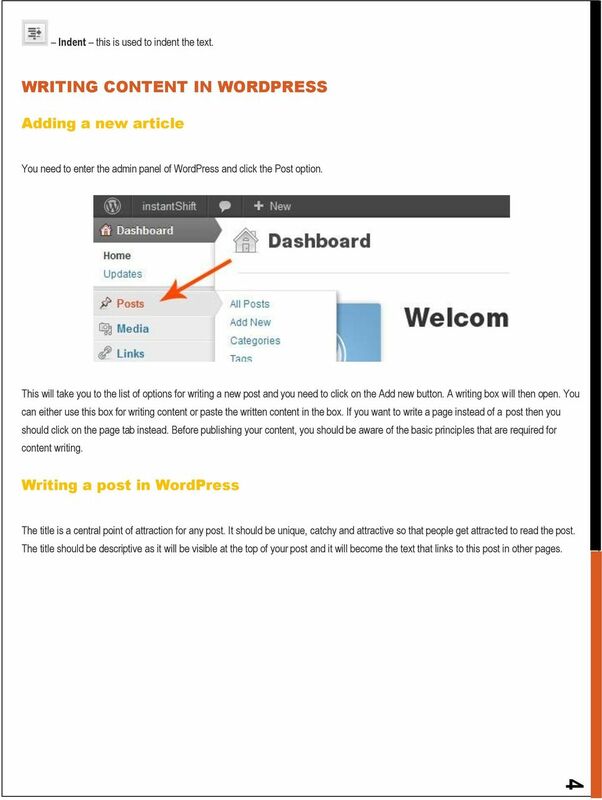 WRITING CONTENT IN WORDPRESS Adding a new article You need to enter the admin panel of WordPress and click the Post option. This will take you to the list of options for writing a new post and you need to click on the Add new button. A writing box will then open. You can either use this box for writing content or paste the written content in the box. If you want to write a page instead of a post then you should click on the page tab instead. Before publishing your content, you should be aware of the basic principles that are required for content writing. Writing a post in WordPress The title is a central point of attraction for any post. It should be unique, catchy and attractive so that people get attracted to read the post. The title should be descriptive as it will be visible at the top of your post and it will become the text that links to this post in other pages. 6 5 You can use the permalink editor to give a shorter file name to URL path. For example, if the title of your post is This is the best post ever, you can simply change it to best-blog-post. If you have used Microsoft word for writing your content then it could create a little hassle. Copying and pasting from a Microsoft profile will transfer lots of formatting in the text editor of WordPress. You can make this process simple by copying and pasting content in note pad first as it will remove all the formatting of the content. After that, you can easily post data in WordPress. 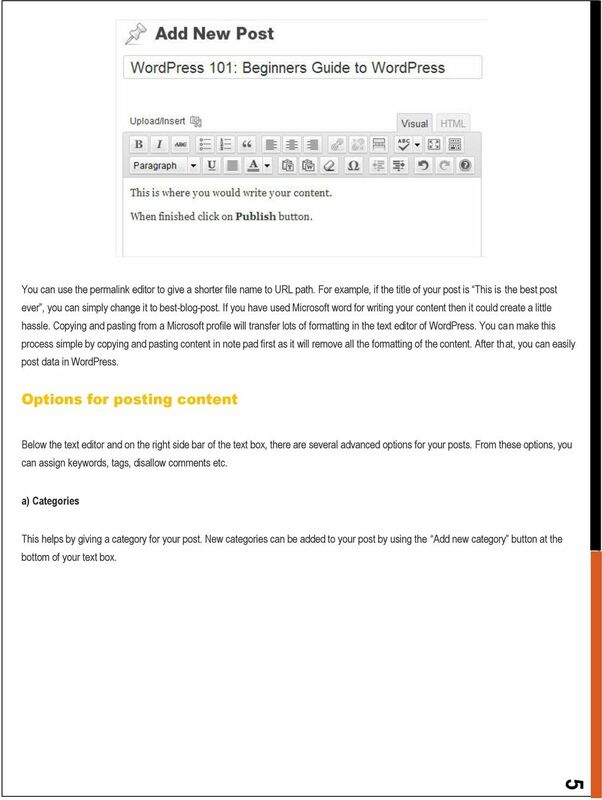 Options for posting content Below the text editor and on the right side bar of the text box, there are several advanced options for your posts. From these options, you can assign keywords, tags, disallow comments etc. a) Categories This helps by giving a category for your post. New categories can be added to your post by using the Add new category button at the bottom of your text box. 7 6 You can also manage the categories by using the categories link below the post tab. If you don t assign a category, it will automatically get shifted to default. Categories are really essential so you should make sure that the proper category has been assigned to the content before posting. Try to avoid changing the category after posting because web spiders take a long time to locate such edited posts. b) Tags Tags are another form of categorizing your post. You can use keywords or select the tags provided by WordPress. For adding keywords, post them in the tags box separated by commas to get the work done. 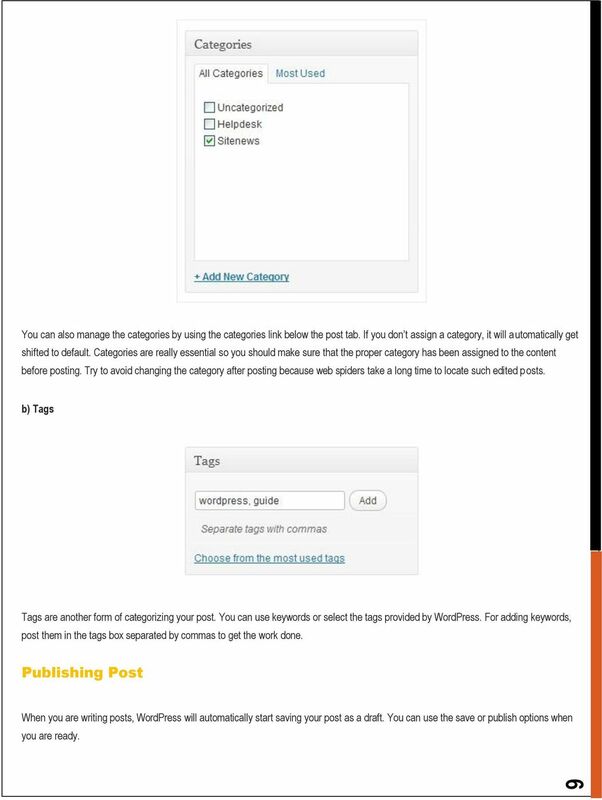 Publishing Post When you are writing posts, WordPress will automatically start saving your post as a draft. You can use the save or publish options when you are ready. 8 7 The preview option allows you to view how the post will look after getting published. You should open the preview page in a new tab so that you can easily jump back to the write post page. When you click the publish button, you will be directed to the write post page. Your posts will not be published on the web until you click the publish button. You can also select a specific date for publishing of your post. The All Posts option will show the published and unpublished posts for your website. WRITING PAGES Pages are different from the blog posts as they are static pages without the flow of chronologically organized posts. These kinds of pages are often the main navigation centres of the website and they don t need to be changed often. They can be the basic pages such as an About Us or Contact Us page. This can also be a whole series of articles and sub-pages that reside as a child of another higher ranking page. Writing a page on WordPress is similar to writing a post. After clicking the Add New link, begin writing a new page or view the All Pages link option to see and manage your current list of pages. The graphic editing icons can be used for editing the page. Like writing post, you should give a good title to your page. 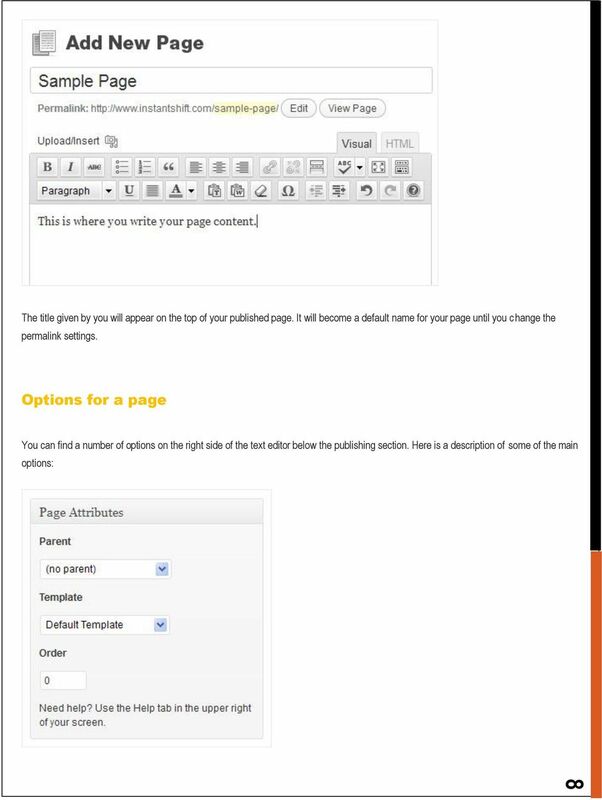 10 9 a) Page parent This helps you to select the location of the page with respect to other pages in the website. You can create a hierarchy of pages along with subpages for easy navigation on your website. b) Page template The page template should be different from the posts. 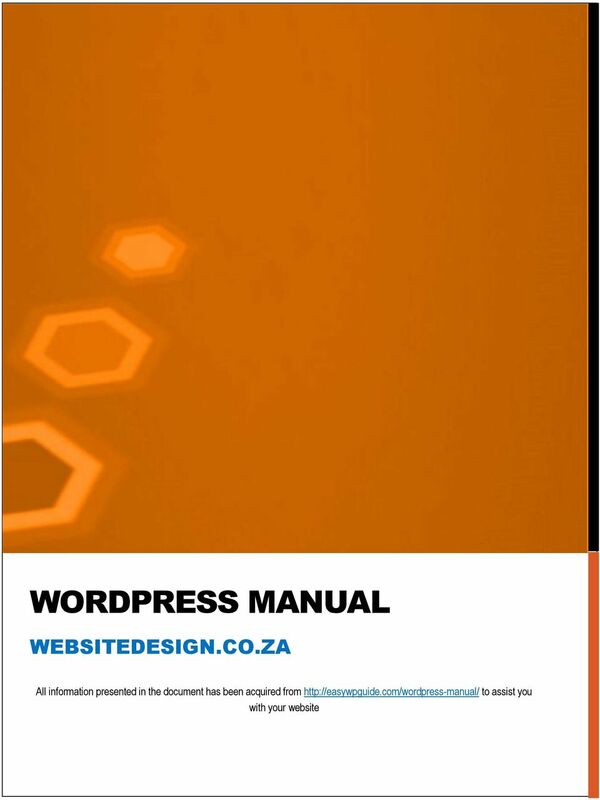 You can select from a range of different templates that are available from WordPress. c) Page order This option is used to create a menu of the pages in the sidebar of your website. You can set the order of pages on the basis of hierarchy or otherwise they will be stored alphabetically. 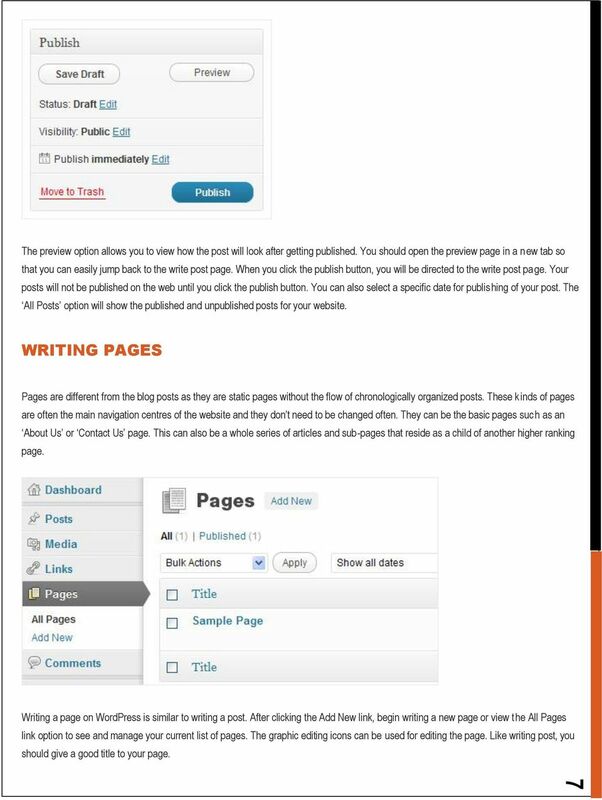 Saving and Publishing the page Writing and publishing of the page in WordPress is similar to publishing a post. The page will get automatically saved to drafts as you type. You can also use the preview option to check the look of the page before publishing it. This preview option should open in the new tab so that you can get back to the original post after having a look on the preview. Clicking on the publish button will publish your page on the web. 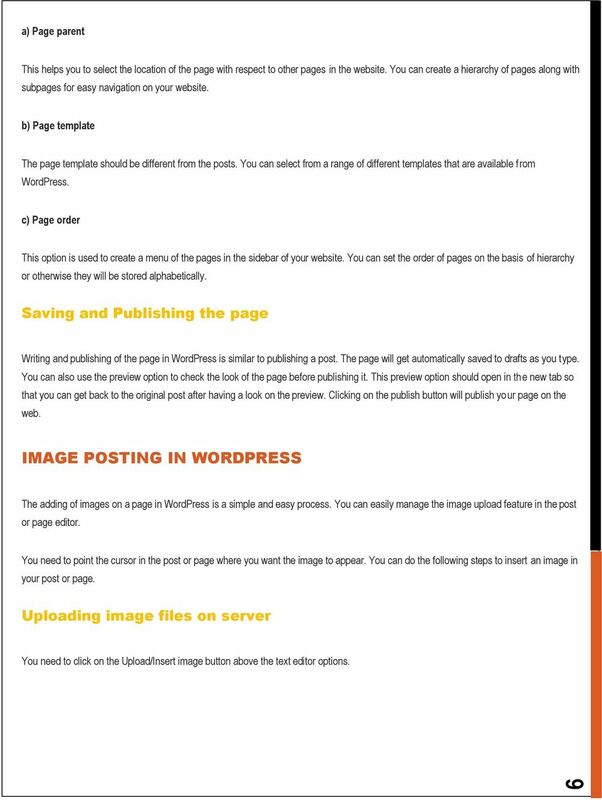 IMAGE POSTING IN WORDPRESS The adding of images on a page in WordPress is a simple and easy process. 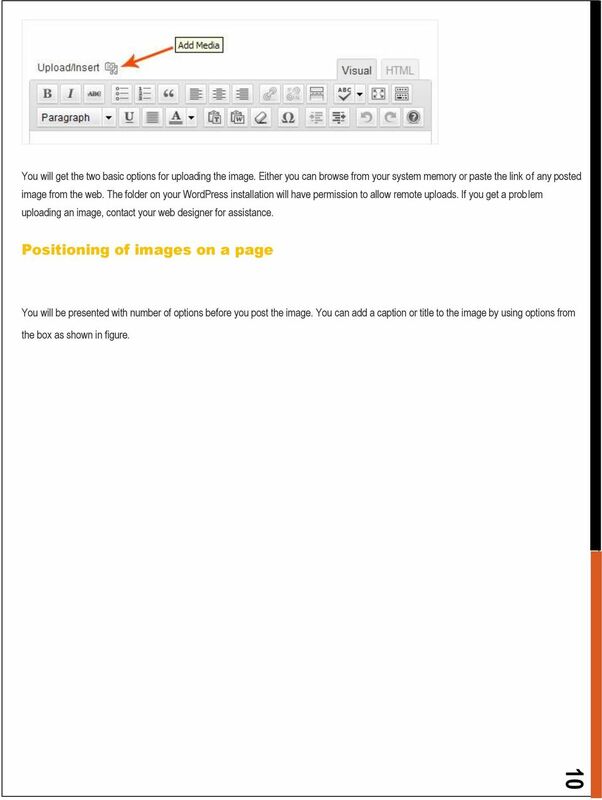 You can easily manage the image upload feature in the post or page editor. You need to point the cursor in the post or page where you want the image to appear. You can do the following steps to insert an image in your post or page. 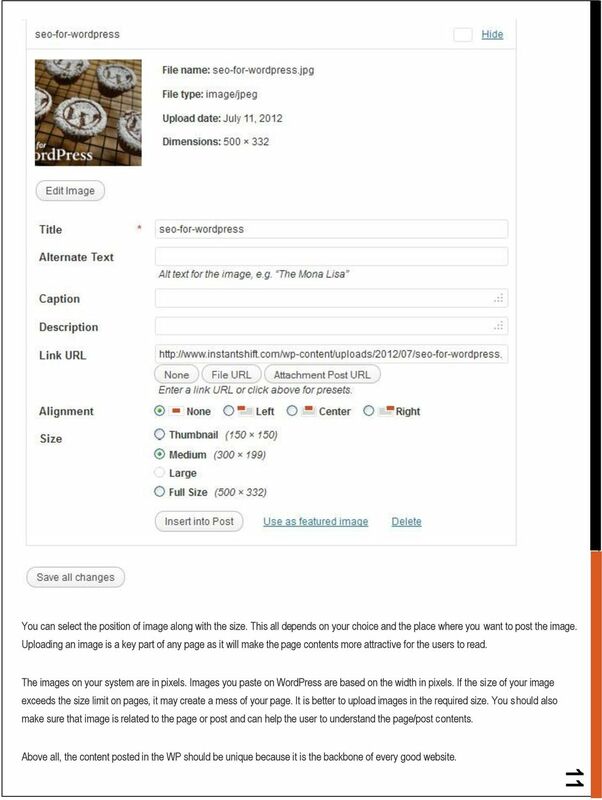 Uploading image files on server You need to click on the Upload/Insert image button above the text editor options. 11 10 You will get the two basic options for uploading the image. Either you can browse from your system memory or paste the link of any posted image from the web. The folder on your WordPress installation will have permission to allow remote uploads. If you get a problem uploading an image, contact your web designer for assistance. Positioning of images on a page You will be presented with number of options before you post the image. You can add a caption or title to the image by using options from the box as shown in figure. 12 11 You can select the position of image along with the size. This all depends on your choice and the place where you want to post the image. Uploading an image is a key part of any page as it will make the page contents more attractive for the users to read. The images on your system are in pixels. Images you paste on WordPress are based on the width in pixels. If the size of your image exceeds the size limit on pages, it may create a mess of your page. It is better to upload images in the required size. You should also make sure that image is related to the page or post and can help the user to understand the page/post contents. Above all, the content posted in the WP should be unique because it is the backbone of every good website. 13 12 ADDITIONAL INFORMATION Information All information presented in the document has been acquired from to assist you with your website. If you need any additional help please do not hesitate to contact from if you need any advance changes to the website our you would like to update to look and feel, please or call so that we can assist you with a quote. JCE Editor Icons. Help Learn all about the JCE Editor. Undo Undo the last action. Redo Redo the last action. 1. Log into the account at http://atlantaprops/public_html/wp-login.php using your username and password 2. This opens the Wordpress dashboard. Instructions for updating your website will be located here. UHR Training Services Student Manual October 2012 1 Logging in to CareWorks Clicking the copyright symbol on the bottom left of the footer takes you to the sign-in screen and then to the control panel. 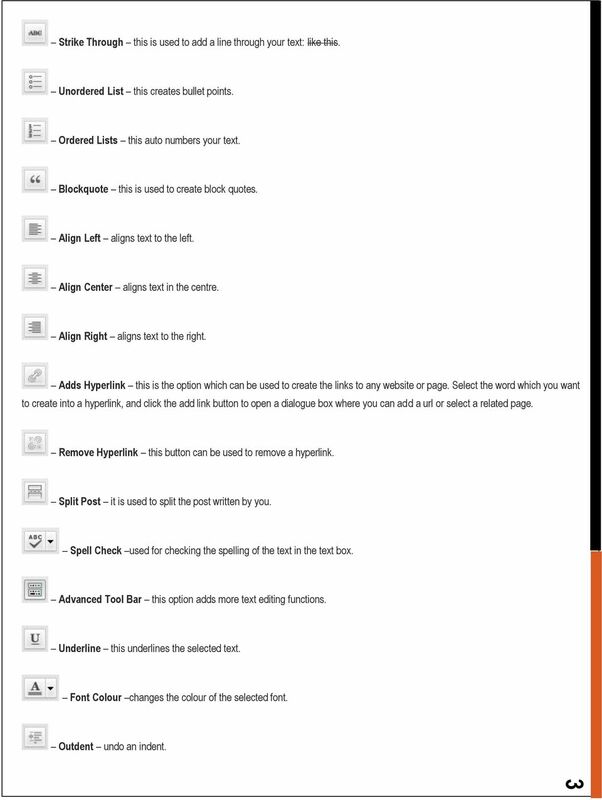 WYSIWYG Editor in Detail 1. Print prints contents of the Content window 2. Find And Replace opens the Find and Replace dialogue box 3. Cut removes selected content to clipboard (requires a selection) 4. OIT Training and Documentation Services Content Management System End User Training Guide OIT TRAINING AND DOCUMENTATION oittraining@uta.edu http://www.uta.edu/oit/cs/training/index.php 2009 CONTENTS 1. Cascade Server. End User Training Guide. OIT Training and Documentation Services OIT TRAINING AND DOCUMENTATION. oittraining@uta. WordPress is an online publishing suite that allows you to create and edit a blog. The Home link will bring you back to the Dashboard after. Workflows alert you to outstanding assets waiting for approval or review.